Eggless Tutti Frutti Cake recipe in Pressure Cooker - Learn how to make Eggless tutti frutti cake easily in your pressure cooker with step by step pictures and instructions. 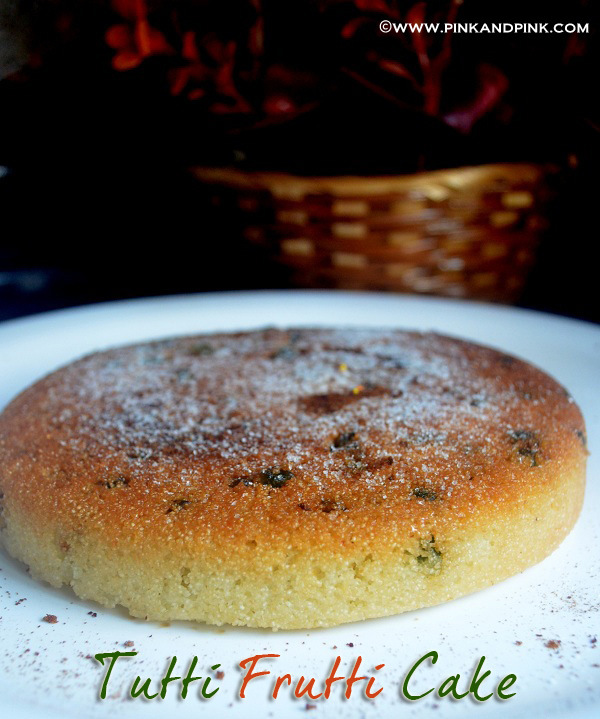 I made this cake with semolina/rava as I prefer Semolina/rava over all-purpose flour/plain flour/maida cake due to the unique taste and health benefits. Pressure cooker baking will be successful after few trial and errors. Yes, Now I am confident that I can make any cake in pressure cooker. After making few pressure cookers, I learned how to make perfect cakes in the pressure cooker. 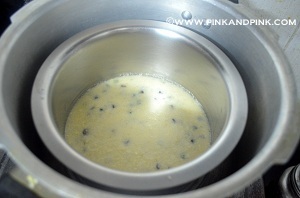 If you are baking in pressure cooker for the first time, this recipe will be basic and simple. 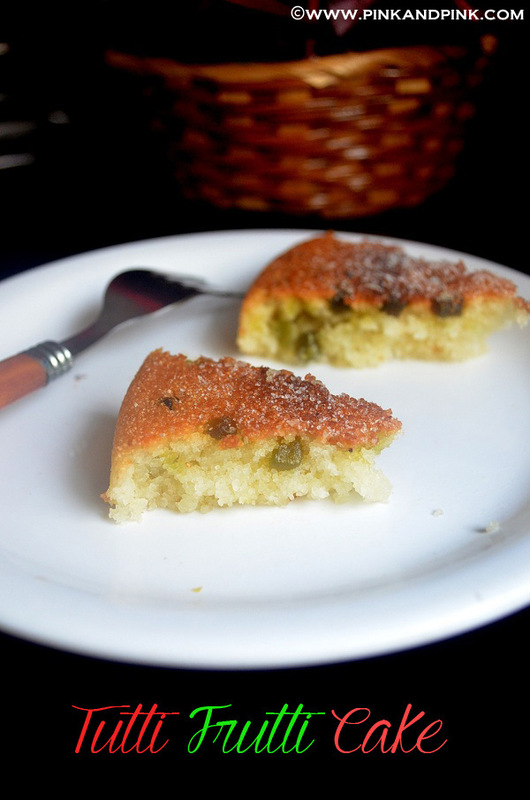 When I made eggless semolina cake(rava cake) last time in pressure cooker for my hubby's birthday, I added tutti frutti as one of the toppings. I loved the cake bites with tutti frutti especially. So, I decided to make tutti frutti cake last time and it came out very well as expected. Mix rava(sooji), sugar and yogurt and beat well with electric blender or mixie. You can use whisk manually too. 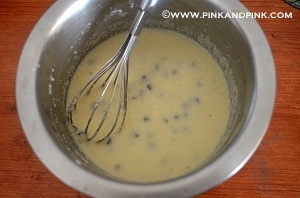 Add sugar 1/2 cup first and then add little by little after tasting the batter. Smooth batter should be formed and there should not be any lumps. You can sprinkle milk if you feel that the batter is too solid. I did not add it as my batter was perfect. Keep it closed for 30 minutes. Add baking powder, cooking or baking soda, vanilla essence(1/2 tsp is minimum, add more if required), melted ghee, saffron, tutti frutti and cardamom powder to the batter. Mix well and keep it aside. It is very important to understand how you are going to use the pressure cooker to bake the cake and the basic setup. I have used Prestige 5.5 ltr cooker this time. 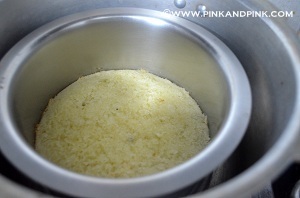 I have tried making Pressure Cooker Eggless Vanilla Semolina Cake before in pressure pan before. 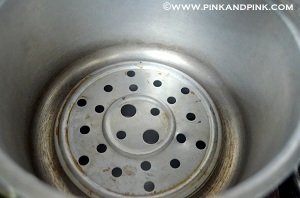 Remove the gasket and whistle from the lid of the pressure cooker. Close the pressure cooker with the pressure cooker lid. Heat the cooker in high flame for 5 minutes. Do not add water. Meanwhile, add 1/2 tsp ghee or butter in the cake pan and grease the pan well. You can use cake pan which you can place inside the cooker or you can use any super thick stainless steel or aluminium bowl as I have used. The bowl should not touch the sides of the cooker. The main idea is the body of cake pan should not touch the cooker directly. Add the cake batter in the cake pan. Once the cooker is preheated, open the cooker lid. 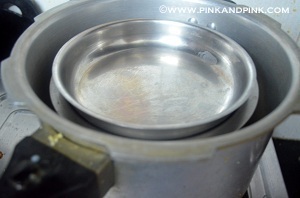 Carefully place the separator/cooker plate and then the cake pan inside the cooker on top of the separator plate. The cooker will be very hot. So, make sure that you use a good and steady pot holder to put the cake pan inside the cooker. If you do not have cooker plate, you can use any similar perforate plate. Close the lid and keep the flame in medium flame for 15 minutes. Then put the stove in low to medium flame and cook till you can insert a knife and take it out neatly. It will take an average of 20-30 minutes totally. But you have to check once in a while to make sure that the cake is getting cooked properly. As I said, I have not used the cooker lid this time as some people say that cooker will be damaged though I am not sure how true it is. I just used a thick stainless steel lid. It was easy for me to check the progress frequently. Do not cover the entire cooker. You need to cover only the cake pan if you are not using cooker lid. My cake was ready in 25 minutes approximately. I cooked in low-medium flame. The time varies with the cake pan, pressure cooker, ingredients you use and the flame in which you cook. How to check whether the cake is ready in cooker? The bottom of the cake which touches the pan should turn golden brown in color. You can see the edges of the cake also turning to golden brown in color. Insert a knife or tooth pick in the center of cake and take it out. If it comes out clean, your cake is ready. Once the cake is ready, switch off the flame and keep the semolina cake closed for 5 more minutes. After that, take the cake pan and turn it upside down and shake it slightly so that the cake comes out of the pan. Do not overcook the cake otherwise it will get burnt. So, frequent checking is important after 15 minutes of time. The bottom of the cake would have turned to a beautiful golden brown color once the cake is perfectly cooked. Remove the cake from the pan within 5 minutes after you switch off the stove. Otherwise the moisture content in the cake will start evaporating and the water drops back to the cake which will spoil the cake. The topping is absolutely your choice. You can use frosting cream, nuts and dry fruits/cherry(you can aso add these before you place the pan inside the cooker either sprinkling them at the top or mixing with the batter), chocolate shavings, chocolate syrup or even nothing. The tutti frutti cake itself was so delicious. But I just added powdered sugar for photography purpose. 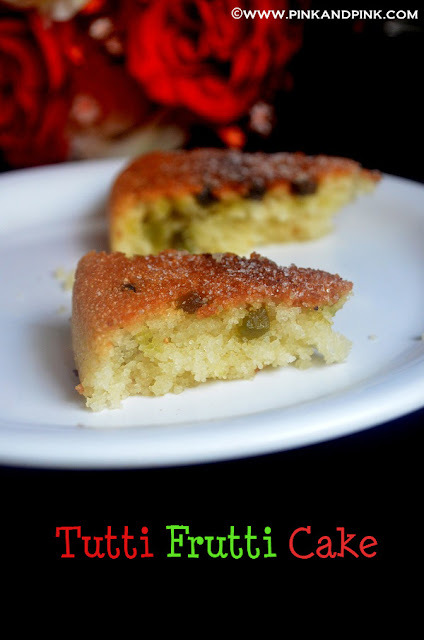 Hope you liked the recipe - Eggless Tutti Frutti Cake Recipe - How to make tutti frutti cake in Pressure Cooker. Please try it out and let me know your feedback.